nmcn are delighted to announce that a key milestone has been reached in the construction of a new commercial office development at Didsbury Technology Park, for our client Bruntwood. nmcn (formerly known as North Midland Construction Plc) are delighted to announce that a key milestone has been reached in the construction of a new commercial office development at Didsbury Technology Park, for our client Bruntwood. 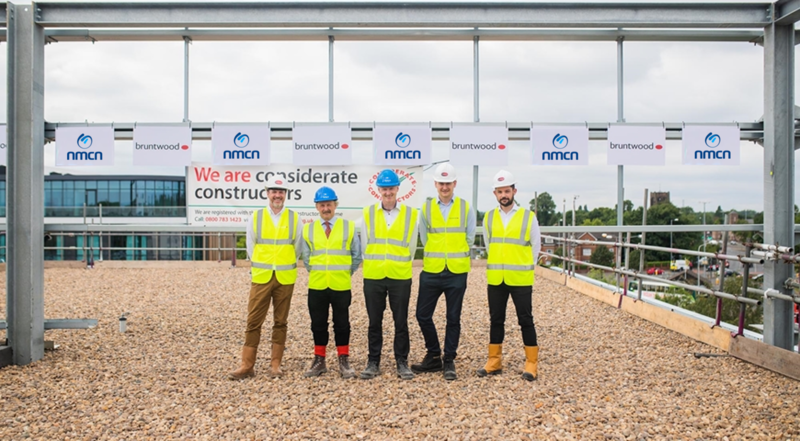 nmcn are the main contractor on the project and have recently completed the superstructure of the building – a major construction milestone, which was celebrated at a ‘topping out’ ceremony on site (a celebration of the final structural beam being laid). The first phase of the wider development will house 20,000 sq ft of grade A space. Although still under construction, more than half has already been let. Once complete, the site will provide over 155,000 sq ft of new purpose-built commercial workspace as well as a multi-storey car park. The site is ideally located, with outstanding connectivity to key hubs including Manchester City Centre, the Oxford Road Innovation District, and Manchester Airport. Once complete Didsbury Technology Park will become home to a cluster of high-growth, science and technology businesses which will positively impact both the local and wider regional economy. The entire site is expected to be developed and occupied by 2020. Robert Moyle, executive chairman for nmcn, said: “We are delighted to have been entrusted by Bruntwood to undertake this prestigious contract and it further consolidates our increasing presence in the North West.